The RE7002 suspension system provides 3.5 inches of lift for your TJ/LJ at an economically feasible price. This suspension system is ideal for an entry-level vehicle owner or those on a smaller budget. 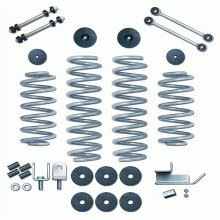 This Standard lift systems features new coil springs, bump stops and extended sway bar end links. The stock control arms, tack bar and other components are reused. This system will perform smoothly on and off the trail, and is easily upgradeable to either a 3.5 or 4.5-inch Super-Flex system. This suspension will allow the use of 33 x 12.5 tires.